Status. July 22nd: Laura and I are canoe camping around St Regis Lake in the Adirondacks for five days. 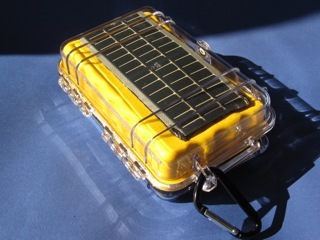 I’m solar blogging the trip and will post in August. This blog post documents how to make 100% solar powered video/photo kits with on-camera training for beginners for about $300 or less using off-the-shelf products (Prices as of May 26th, 2010). Non-profits who want staff to inexpensively document projects for Web broadcasting. University study abroad programs that want to equip students to document their experiences for their studies and also for Web 2.0 marketing initiatives. Travelers, scientists or researchers who are going off the grid. Charges batteries in 4 hours of direct sunlight. 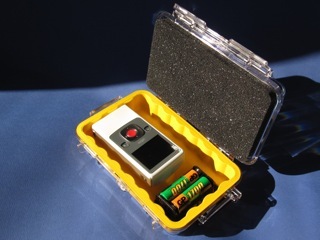 Pelican Brand Model 1050 Micro Case with Foam. Or. Flip Ultra video camera if you want video only. 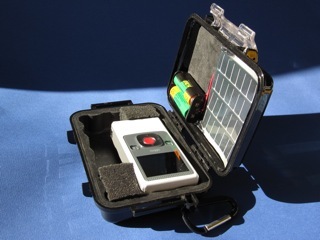 Pelican Brand Model 1040 Micro Case with Foam. 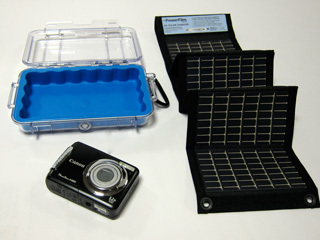 “PowerFilm” Inc. AA solar battery charger with 4 Sanyo 2000 mAm batteries. 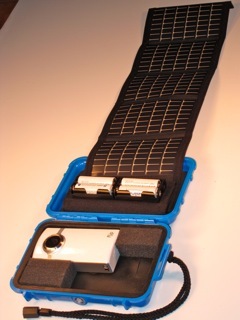 Load kit with camera and panel printed directions. Easier training and uploading video only kit. This training video is unique because it plays in the camera’s viewfinder. 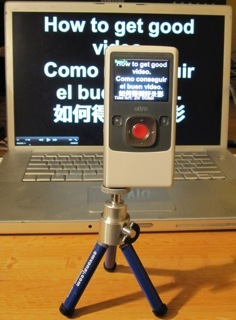 The training video helps anyone get good light, sound and framing in any language. 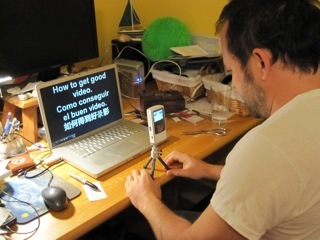 The training is usable with no audio and/or by non-English speaking people, but the videoalso has an English voice over explaining the three lessons. Download the video by clicking this link (243 MB, will take a little while!). You will be taken to Blip.tv where you can download the video. Save video to your computer. Load Training Video: Set your camera up in a dark room, level with, and about 18 inches from, your computer screen. The goal here is to set up your camera up in front of your computer, then “Play” the video on your computer while you “Record” it onto your camera. It’s a simple and wonderful hack to load any video on any camera for playback in the camera’s viewfinder. Open video and put into full screen mode and frame camera so video fills camera’s viewfinder. “Play” the video to test the audio level. Make sure the audio plays loudly. Then reset the video the beginning. Click “Record” on the camera, and then immediately click “Play” on the video. When the video stops, click “Stop” on the camera. Play the video on your camera to make sure it’s OK.
Now try playing the video in your camera. Make sure to delete all other videos before loading camera into case. If you make a video using solar power, tag it “solarpoweredvideo” (no spaces). So we can all search for similar videos. I donated a kit to the The Caribbean Association for Feminist Research and Action (CAFRA) soon after the earthquake. They reported in July 2010 that they were using it to document the on-going work of the organization, specifically with orphans in Leogane. They have also been sharing the camera with other organizations, such as the children’s charity CAFA in Port-au-Prince. 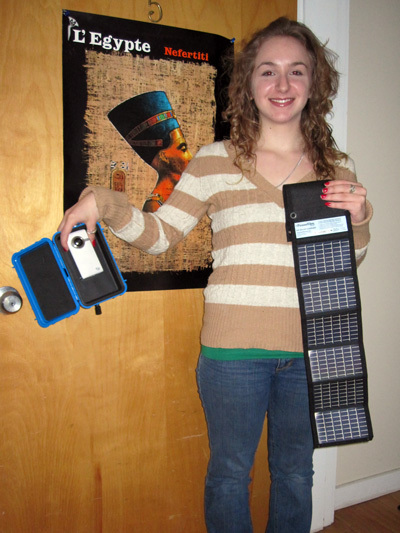 Sarah is taking a kit to Egypt as part of her Marlboro College World Studies Program. We’ll post her videos when she comes back in May 2010, or sooner if she uploads videos from Egypt, or ships the kit back to us and we upload her videos. Here’s a sample of 100% solar powered videos I’ve made. 5. Sledding in Brattleboro, Vermont. Charge time for two AA batteries : 18 hours of direct sunlight. Flip Ultra, with 50% charitable organization discount. 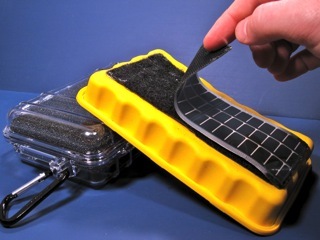 DIY AA solar battery charger, or assembled solar battery charger. 1 foot “Industrial Sticky Back” Black Velcro. 4 Rechargeable 2000 mAh AA Batteries. Tools: Solder iron if you use the DIY panel, solder, flux, knife. For unny locations, where you only need to record about an hour of video a week while batteries charge. Download training video and load onto the camera. Silicon Solar 2AA battery charger, on Silcone Solar Site. Pelican 1020 Case, on Amazon. Shoe Goo on Amazon . Pelican Brand Model 1040 Micro Case with Foam, on Amazon. 4 Rechargeable 2000 mAh AA Batteries, on Amazon . DIY solar battery charger, Sundance Sunbender DIY 2AA Charger, Or Pre-assembled solar battery charger from Sundance Solar. 1 foot “Industrial Sticky Back” Black Velcro. Hardware stores usually sell by the foot, or on Amazon.